The San Antonio Express News recently profiled members the Crossmen organization as they get set for the 2008 drum corps season. 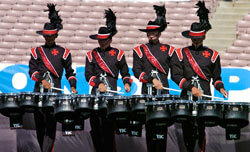 The Crossmen moved their operations from the East Coast to San Antonio last fall. Read the article on MySanAntonio.com.